This is NOT the post I intended for today. *grin* Now doesn’t that make me sound organized and thoughtful? As if I actually PLAN for my blog. 🙂 I really really want to post about the Crown and Pearl. I had so much fun there last week. But yesterday was a real treat for me in the way of seeing friends. So often we only get to wave at friends in IM. Then you look up and realize it has been days since you actually talked. That’s why today’s post is a snapshot of my stolen moments with friends. zazek and I so rarely get time to play. We have hunted Easter eggs together, visited AM Radio’s The Red and The Wild together. But mostly we only exchange a few words in IM and then one of us has to run. Last night we actually had time to talk, catch up on life. 🙂 zazek is doing something that I can’t do. Even if I were capable of doing it – I probably would not be brave enough to do it. zazek began blogging a few weeks ago. “So?” you might ask. “Doesn’t EVERYONE blog these days?” Maybe. But zazek is not writing in her native language. I only know one language. I have a smattering of others but certainly no competency. Even if I KNEW another language well, I doubt I would be writing in it. So zazek has my great admiration and respect! Her blog is fun to read, too! *grin* Check it out for yourself. Dark and I used to have time to dance and party and fly planes. Then somehow my schedule got totally out of control. We chatted periodically, but rarely ended up in the same SLURL. Yesterday we were chatting about building. 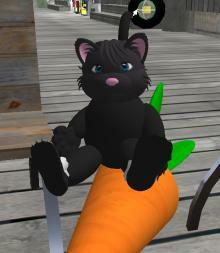 I am still fairly intimidated by manipulating prims. I simply do not understand path cut and taper and shear. I know, I know – you all tell me to “try it, play, experiment”. I do not learn that way. I like having another human being nearby who can answer questions. Dark tp’d me to a sandbox to give me a quick introduction to torturing prims. *grin* I did my best – teasing a pink torus. 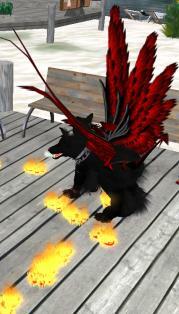 But you can see that Dark REALLY knows how to torture prims. 🙂 It was a quick start, but he’s promised we can do it again. YAY!!! Thank you, Dark! Oura got home yesterday. *hugs* Welcome back, Oura. I missed you. We started in immediately on girl talk, catching up on the week’s events for us both. I told her about my escapades at work, trying to move my AO and boots and hair over to opensim. We started inventory diving – looking for any fullperm boots and clothing. LOL. We tried on some pretty amazing outfits. I promised her I would NOT take pictures or blog, so you will simply have to imagine the wet T shirts that we found. Is that okay, Oura? Can they use their imaginations???? Oura also noticed that my bear either smokes or the room was excessively cold, causing breath condensation. 🙂 Being in a silly mood, we somehow decided that the bear was indulging in a post activity cigarette. *grin* Since none of the other bears were smoking, there is still some mystery here. We ended up standing on the bed, swapping freebie outfits, finally finishing the evening as twins. I guess I haven’t mentioned work in the last few days. I’ve been involved with the usual building for the demos. 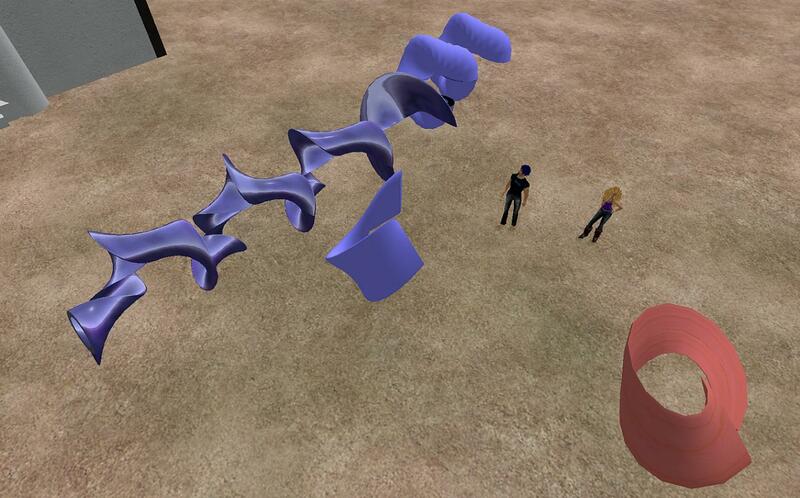 We’ve been meeting with others trying to learn more about opensim and developing in virtual worlds. We’re making great progress, imho. We plan to begin demo’ing to folks next week. I’ve been attending meetings in a variety of virtual worlds. As you know, I really get tired of being “dweebie”. A friend wrote and gave me an AO that works in opensim, another friend taught me how to build my own AO in SL using the ZHAO. I bought poses and FINALLY understand (somewhat) what happens in my AO. Maybe I will finally have the courage to toss the 2 poses I dislike. 🙂 I have different hair as well. I have been learning to wheel and deal with builders and scripters. I’ve also been friending coworkers and enjoying all the cool lectures and such that are available. Have I mentioned recently how much I enjoy my job? And now I even have boots and hair. Well, I did it. I made hair. It’s not the world’s best hair, but it’s not totally horrible either. 🙂 As a matter of fact, I plan to ship it over to OpenSim. I learned a LOT in the last 72 hours. I know how to use Gimp. I learned about taking photos. I learned more about building. I appreciated yet again how hard it is to make hair. But. I did it. And I will continue to work on this. The color is not what I want. I know how to fix that. I need to learn a lot more about layering the prims. About rotating prims. But considering everything…. I’m feeling fairly satisfied with this iteration. I actually have 4 versions at this point. The first – I misunderstood about the top of the hair. So in essence I have a cap that has hair coming out of it. *grin*. The other versions are all variations on this one. The second version was this hair without the fringe-y bangs and headband. The third version has bangs. And this is the 4th. Also known as Round6 in my inventory. *grin* That’s because the first 2 “rounds” weren’t complete – merely building blocks. Now I must turn back to scripting. I am way behind on my scripting work and I have a deadline coming very quickly. But I admit it – doing this was fun. Frustrating, maddening, but ultimately fun, satisfying and educational. I’d promised Dale that we’d go fishing. She’d never done the 7 Seas Fishing. So as a “reward” for seeing me tthrough the Ivory Tower Library of Prims, I took her over to Oura’s to learn to fish. I signed up with 7 Seas several months ago and had a great time. Then I never got back to it until January, when Bailey flooded the Crown and Pearl one evening. 🙂 So I needed to upgrade to the latest version fishing pole. And I learned a lot about the details that I’d not known before. 7 Seas is a fishing game within SL. Each fish caught has a point value. Everyone’s scores and catches are maintained, all across the world. There are different levels of expertise. 7 Seas maintains a Hall of Fame, a forum, a photo gallery and more. People all over SL are addicted to 7 Seas fishing. Even more fun – everything you catch is useful. You can release your fish into a pond or an aquarium, or simply have them swim about your head. 🙂 You can even name them. You may not catch a fish. You may catch a part of a bathing suit. Keep fishing – the other piece is out there as well and then you can wear it. You may pull up some salvage. Don’t fret – keep fishing. There are more pieces AND blueprints and you may be able to build your own boat or other prize. Once you buy your initial rod, you will be hooked. *grin* Free updates are included. You buy yourself some bait, customize your rod (color, for instance, and other features), settle down and cast! That’s all there is to it. Dale was wearing Dirty Biker hair that night, which she’d customized to her favorite shade of red. Oura admired the color and put on HER Dirty Biker hair as well. LOL. I really liked how they looked and said so. BOTH of them then passed me Dirty Biker hair as well. I was too slow on the camera and Oura was too fast on changing, so I missed the pic of all 3 of us with matching hair. I decided after a few minutes I was way over-dressed for fishing and changed clothes. Which necessitated an update to my Dirty Biker Hair color. So I went back to being blond. But I think I may create my own “biker” look and then I’ll retrieve my black Dirty Biker hair and head out. LOL. Because I KNOW where I can find the bike I want!!!! It was cute. I’m not sure why Tinies need to have special chairs for sitting. Note the carrot that L supplied as well. Certainly the orange set off my black fur and blue eyes quite nicely. But when all is said and done, eh. I still have no desire to be an animal. Perhaps I am simply boring or uncreative. Wearing wings on occasion is amusing. I’m still thinking about getting ears and a tail. But being a cat really didn’t do much for me. Maybe this is like true love – I’ll “know” when the right shape comes along. In the meantime I will simply admire and enjoy everyone else’s creative shapes. Such as this 3-headed dog that leaves fire-y footprints. You really do meet the most interesting people at NCI. I realize there has been a looonnnng delay since my last post. Can I claim that I was resting on my laurels? 🙂 The truth is that sometimes, no matter how strong the siren call of SL, FL is first. And that’s what this week of silence means. So I want applause for my sense of responsibility, keeping my priorities straight and all those other things some of you think I need to remember. 🙂 And when I tell you I went on a mega-shopping spree on Saturday to get ready for Shenlei’s Rave Saturday night, I don’t want to hear about it! I spent mega-hours and mega-L$. I had a blast!!!! So Shen’s invitation says “Theme is universal (interpret as you wish – science fiction, space odyssey, steam punk)”. This is simply too embarrassing. I know what science fiction and space odyssey are. Steam punk??? Clueless. Whatever did we all do before Google??? According to Wikipedia “Steampunk is a subgenre of fantasy and speculative fiction that came into prominence in the 1980s and early 1990s. ” Okay. So what is steam punk fashion??? Googled that as well. According to the NY Times Steam punk fashion is “an adventurous pastiche of neo-Victorian, Edwardian and military style accented with sometimes crudely mechanized accouterments like brass goggles and wings made from pulleys, harnesses and clockwork pendants, to say nothing of the odd ray gun dangling at the hip”. Hmmm. I started searching inworld on Steam punk. I really wasn’t having much success. I found one possibility, but it didn’t really thrill me. I tp’d from place to place, store to store. Met hardly a soul and found almost nothing worth marking. I was beginning to think I’d have to go back and settle for the red outfit that didn’t thrill me. Bona Fortuna smiled on me. Shenlei logged in. I IM’d her and told her I was looking forward to her party but had NOTHING to wear! She sent me some LMs and told me about SLexchange. SLexchange.com is a site where you can search for SL items without being inworld. I followed her LM to Steam Forge inworld, to the store Legacy. Check out the landscaping – gets you into that Steam Punk mood, does it not? I immediately found an outfit I liked (I had help from my significant other picking out the outfit – thanks Hon!). But it was only a top and a skirt. I still needed boots and accessories. I was searching away on SLexchange for Steam Punk. I found belts and boots and wings and all sorts of fascinating things, many of which were on sale in Steam Powered Nuts, a store in Steam Forge. So I wandered over to SPN and browsed about. What cool stuff!!!! I did see an intriguing ray gun or two. 🙂 But I really didn’t see boots that fit my mood. So I tried to buy boots through SLex. Do you remember one of my very first posts when I began this adventure? My coworkers who had done SL kept telling me “it’s easy”. NOTHING about SL is easy. Have I made that clear?? LOL. Perhaps it’s me, but nothing nothing nothing in SL is easy. 🙂 And nothing related to SL is easy. I had to register and enroll and activate an SLex account in order to be allowed to contact the boot vendor. This meant that I had to give email information and get an activation code and go inworld and find an SLex terminal. What a colossal nuisance!!!!! So I did all of that and located a terminal and tp’d there to activate my account. 🙂 And who should be sitting outside the building with the SLex terminal but Shen!!!! LOL. I explained my problems with trying to buy boots and yet again Shen rode to my rescue!!! 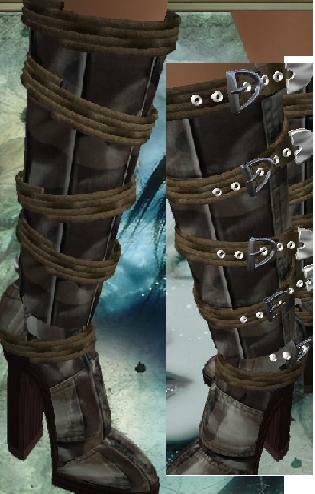 So thanks to Shenlei I have the coolest boots!!! I got confirmation later that day that these boots were indeed cool. C, one of the NCI team, always has fantastic boots and jackets and accessories. I love how she looks. So when C complimented my boots and asked for the LM, I was quite pleased to share it with her. I had my outfit, I had my boots, I knew where I was heading for a choker. I decided that I needed new hair as well. Checked the bank balance – yep, still had something left to buy hair. 🙂 Now here is where I broke from the steam punk genre. My every-day hair was probably better suited to steampunk than what I bought. But I couldn’t help myself. LOL. Have you noticed I have very little self-control when it comes to indulging myself in SL??? Following more of Shenlei’s tips I headed to Analog Dog. Guess what – it WASN’T easy!!!!! 🙂 I’d gone skin shopping a few weeks ago with I so I knew about demo’s. I’d totally forgotten how one buys an object that also has a demo for sale. The demo is hilarious. 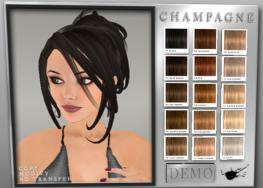 I bought the demo hair, wore it just as you would anything. But there is this big huge wavy box above your head shrieking DEMO to the world! With the skins – the word “demo” is plastered all over. No shoplifting allowed in SL! 🙂 I IM’d 2 women standing in the store and asked for help. One of them kept asking to bite me (yes, sigh, another vampire) but helped me inbetween bite requests. The other helped without asking to bite me. 🙂 I finally figured out from their comments and my memory that I needed to click on the color palette for the hair, not the picture of the hair. The hair comes in 3 different palettes. So I selected one, handed over mega L$ and now I have really fun hair for special occasions! Boots, clothes, hair. Accessories!!!!! 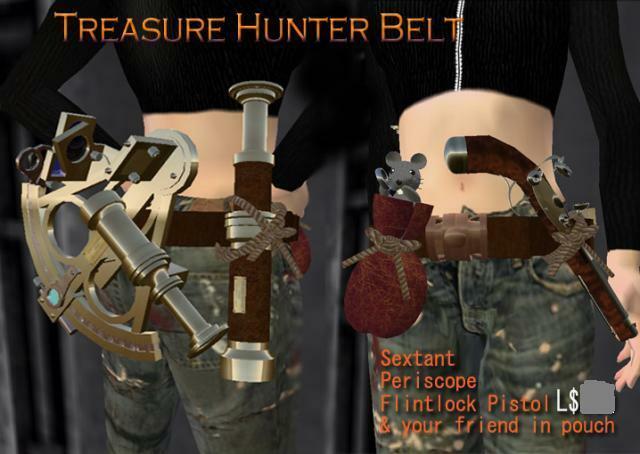 I fell in love with a treasure hunter’s belt. 🙂 How could I not?? A sextant, a periscope, a flintlock pistol and a little mouse in a red pouch! Who could resist that purchase? Certainly not I. 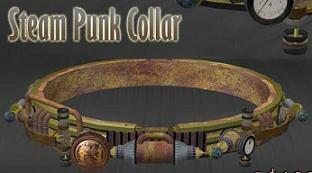 Fell in love with a collar that had lots of gadgets attached also. Interestingly enough, neither was at Steam Powered Nuts or Steam Forge. They were both in a fun store, an old junk factory, on Le Petit Prince (/LPP/223/69/31 for anyone who may be interested). Now I had it all! TP’d back to NCI where my friends were all having a fishing contest and showed off the outfit. They gave the NCI seal of approval. 🙂 I was all set to party! And that, my friends, will be it’s very own blog. Because I have NEVER been to such a wild and stimulating party!! I never knew I could dance like THAT!! !